Photo: © UNHCR / A. Harper. With war raging across large parts of the Middle East and Africa as well as elsewhere, around 5.5 million people were forcibly displaced during the first six months of 2014. 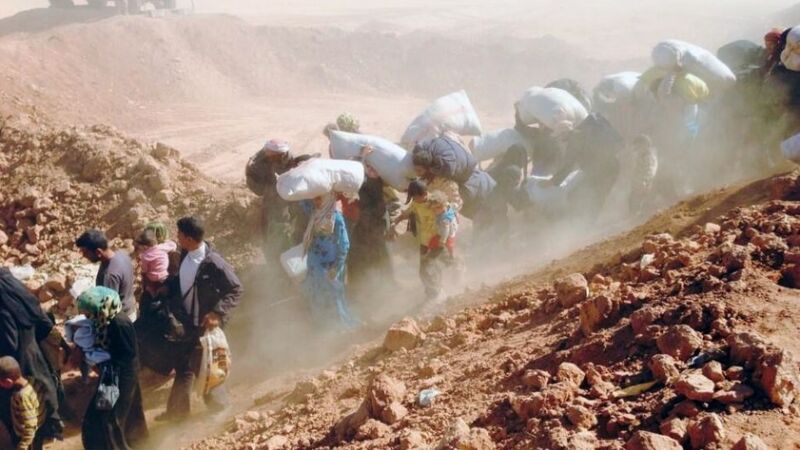 According to the UN refugee agency’s (UNHCR) new Mid-Year Trends 2014 report, 1.4 million of these newly uprooted people fled across international borders, thus becoming refugees, while the rest were displaced within their own countries. Among the report’s main findings are that Syrians, for the first time, have become the largest refugee population under the refugee agency’s mandate (Palestinians in the Middle East fall under the care of UNHCR’s sister-organization UNRWA), overtaking Afghans, who had held that position for more than three decades. At more than 3 million as of June 2014, Syrian refugees now account for 23 percent of all refugees being helped by UNHCR worldwide. “During the first half of 2014, conflict continued to result in the displacement of millions of refugees and internally displaced persons (IDPs) globally causing significant changes in the trends and number of refugees, asylum-seekers, IDPs and others of concern to UNHCR. In this context, management of humanitarian crises is increasingly complex, including with regard to the production of timely and comprehensive statistics.” — Mid-Year Trends 2014 report. Despite dropping to second place, the 2.7 million Afghan refugees worldwide remain the largest protracted refugee population under UNHCR care. The agency defines a “protracted refugee situation” as one that has existed for at least five years. After Syria and Afghanistan, the leading countries of origin of refugees are Somalia (1.1 million), Sudan (670,000), South Sudan (509,000), the Democratic Republic of the Congo (493,000), Myanmar (480,000) and Iraq (426,000). Pakistan, which hosts 1.6 million Afghan refugees, is the biggest host country in absolute terms. Other countries with large refugee populations are Lebanon (1.1 million), Iran (982,000), Turkey (824,000), Jordan (737,000), Ethiopia (588,000), Kenya (537,000) and Chad (455,000). By comparing the number of refugees to the size of a country’s population or economy, UNHCR’s report puts the contribution made by host nations into context. Relative to the sizes of their populations Lebanon and Jordan host the largest number of refugees, while relative to the sizes of their economies the burdens carried by Ethiopia and Pakistan are greatest. 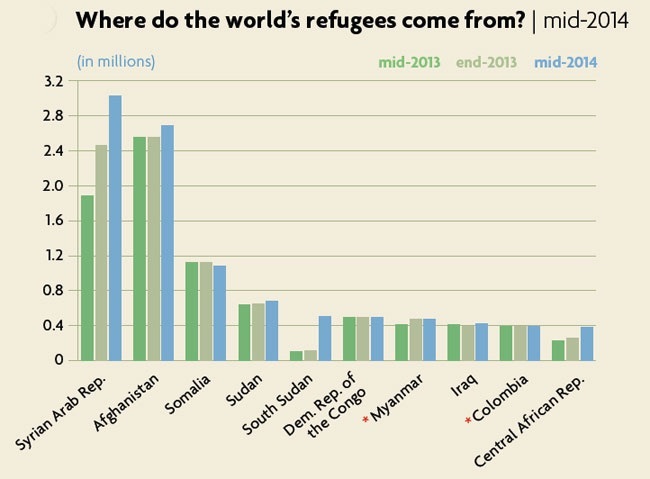 Source: Mid-Year Trends 2014, UNHCR. In all, the number of refugees under UNHCR’s mandate reached 13 million by mid-year, the highest since 1996, while the total number of internally displaced people protected or assisted by the agency reached a new high of 26 million. As UNHCR only provides help for IDPs in countries where governments request its involvement, this figure does not include all internally displaced people worldwide. UNHCR’s Mid-Year Trends 2014 report is based on data from governments and the organization’s worldwide offices. As information available to UNHCR at this point in the year is incomplete, the report does not show total forced displacement globally. Those figures are presented in June each year in UNHCR’s annual Global Trends report, which as of end 2013 showed that 51.2 million people were forcibly displaced worldwide. Nonetheless, the mid-year data is a major component of the global total and an important indicator of worldwide refugee and internally displaced persons trends. UNHCR Report Shows 2014 Rise and Shifts in Forced Displacement by Carol Smith is licensed under a Creative Commons Attribution-NonCommercial-ShareAlike 4.0 International License.